WASHINGTON — Researchers have developed a new flexible sensor with high sensitivity that is designed to perform variety of chemical and biological analyses in very small spaces. The sensor's small size means that it could potentially be used inside blood vessels. With additional development, the sensor might be used to detect specific chemicals, DNA molecules or viruses. Paper: C. Chen, R. Yang, X.-Y. Zhang, W.-H. Wei, Q. Guo, X. Zhang, L. Qin, Y.-Q. 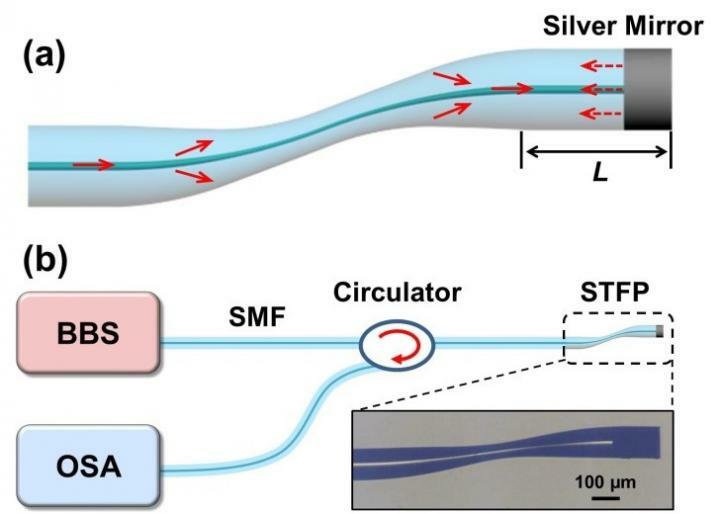 Ning, Y.-S. Yu, "Compact refractive index sensor based on S-tapered fiber probe," Opt. Mater. Express Volume 8, Issue 4, 919-925 (2018). DOI: 10.1364/OME.8.000919.